Prophylaxis of vein thrombosis diseases (prevent intra-vein thrombosis), especially thrombosis related with orthopedics and general surgery. Treatment of the existing deep venous thrombosis (DVT) with no serious clinic symptoms accompanied with or without pulmonary embolism (PE), not including surgery or thrombolytics needed pulmonary embolism (PE). infarction, when concurrently administered with Aspirin. Used in extra-corporeal circulation of hemodialysis to prevent the formation of thrombus. Treatment of acute ST-segment elevation myocardial infarction (STEMI) combined with thrombolytics or percutaneous coronary intervention (PCI) treatment. Using materials of good quality: Shenzhen Techdow Pharmaceutical Co., Ltd. only uses the heparin sodium which is also exported to the US by Hepalink as started material. (Shenzhen Hepalink Pharmaceutical Co., Ltd. is the largest heparin supplier in the world, the main framer of the USP for heparin sodium). 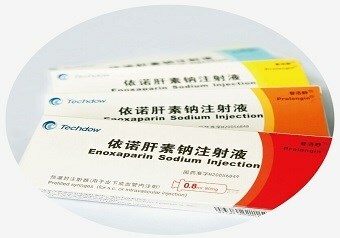 Lowest concentration of residual impurity: According to the test of Guangdong Institute for Drug Control, the key indexes for Prolonging, which is produced by Shenzhen Techdow Pharmaceutical Co., Ltd. are basically the same with，and some of which are even better than that of Clexane, which is originally produced by Sanofi-Aventis. Using the best sterile packaging: The pre-filled syringes used by Shenzhen Techdow Pharmaceutical Co., Ltd. are imported from BD America and GB Germany, which are the same with that of original company, so as to keep the sterility, cleanliness, and safety of products.